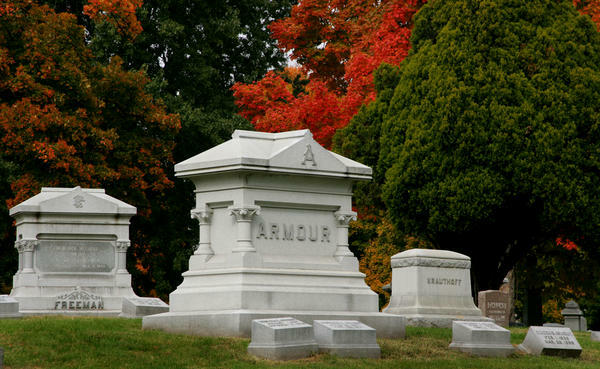 Four of the five brothers who started Armour and Company Meat Packing are buried at Elmwood Cemetery. The cemetery was established in 1872 and is on the National Register of Historic Places. 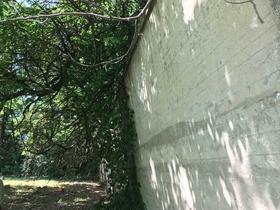 But time has taken a toll on the perimeter wall. Volunteers — guardians of the graveyard — are fighting to keep a section of the 14-foot-tall structure from crumbling onto a section of graves. Tree roots and moving ground have shifted underneath the poured concrete, giving the wall a noticeable inward tilt. And in preserving the cemetery, they're preserving Kansas City history. 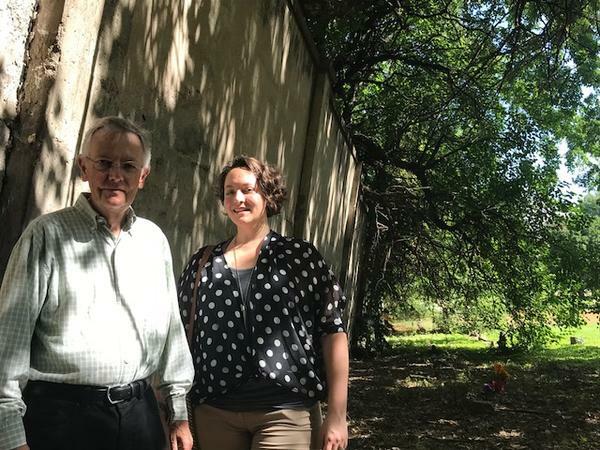 "We're in a race against time," says John Weilert, a volunteer and president of the Elmwood Society Board, the non-profit organization that maintains the cemetery. 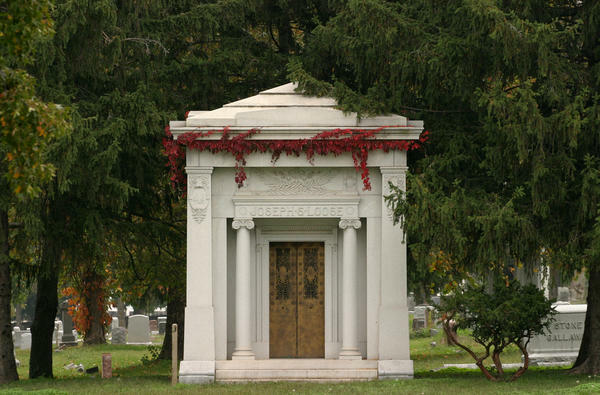 Just inside the entrance is one of many elegant mausoleums: that of Joseph S. Loose. Its ionic columns are framed by towering evergreens. "He and his wife are in there," says Weilert. "He made part of his fortune off Hydrox cookies." Joseph and his brother Jacob (interred not far away in another stately tomb) built the Loose-Wiles Biscuit Company, maker of Sunshine Biscuits. Loose Park and the Loose Mansion bear the family name. The names of some of Kansas City's well-known streets and boulevards are on other tombstones. Mining magnate August R. Meyer, who established a successful smelting plant in the Argentine area, is here. Known for his commitment to beautifying Kansas City, Meyer was the first president of the newly formed Board of Parks Commissioners in the late 1800's. He brought on George Kessler, who drew up the master plan for the city's system of parks and boulevards. When the graveyard was established in the late 19th century, Reform Congregation Temple B’nai Jehudah bought some of the first acreage. It remains on the southwest corner of the cemetery with some of the most distinguished and successful members of the local Jewish community. 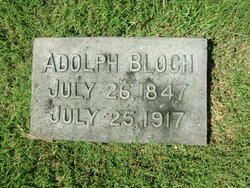 Morris Helzberg, founder of Helzberg Diamonds is one of them, as is Adolph Bloch. His grandsons, Henry and Richard Bloch, founded H&R Block. In the mid 1850s, Sarah Chandler Coates, a Quaker woman from Lancaster, Pennsylvania, came to Kansas City to join her husband, Kersey Coates. He'd invested in land near the Missouri River and joined the anti-slavery, Free-Stater movement, working to populate the Kansas Territory with freed slaves and abolitionists. Sarah Chandler Coates came from a political family and was a pioneering feminist. She founded a local woman's suffrage club and was a personal friend of Susan B. Anthony. 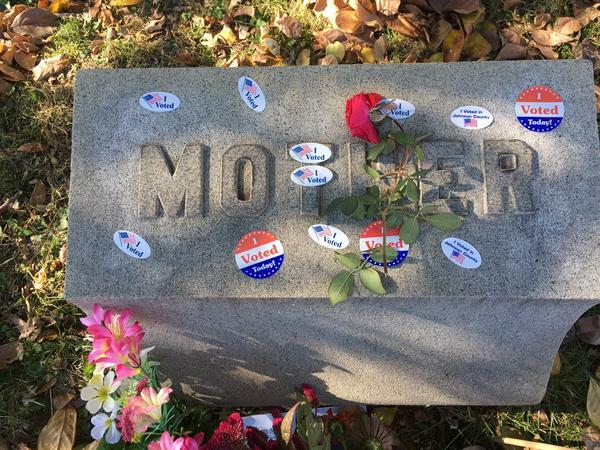 Cemetery board member John Weilert says after the 2016 election, he heard news reports that people had covered the gravestone of suffragette Susan B. Anthony in Rochester, New York, with "I Voted" stickers. When he checked at Elmwood, he found the same thing had happened to Coates' gravestone in Kansas City. "I came out to (Elmwood) and Sarah Chandler Coates' headstone was also full of those stickers." In recent years, more than 100 feet of the western edge of the perimeter wall has been tipping farther and farther into the cemetery. This is the latest, most urgent problem, says Weilert. "That's a precarious angle," he says. "The challenge is it's 180 feet of that wall. You'll see the trees on the other side are pushing the wall over." Volunteers have focused on the overgrown vegetation and need to keep the grass mowed around graves — a daunting task. But Weilert says the possibility that this section of wall could fall took on a sense of urgency when they realized where the concrete could land. "If it came down, it would land on that first row," Wielert says, pointing to some small headstones. "When we were doing the measurements I was looking at those markers ... and they were all the markers of children who died in the 1920s or early 1930s. We just can't let that happen."